Is CBD Oil legal in My State? Everyone wants to know if CBD is legal in their state. This handy fact sheet is meant to provide you with a quick reference you can check for where you live. There are 6 states where CBD is completely illegal because all forms of cannabis are illegal in those states: Idaho, South Dakota, West Virginia, Nebraska, Kansas, and Indiana. For those of you who unfortunately live in these states, using CBD will be at your own risk. While this is not legal advice, law enforcement are not targeting people who use CBD for personal use. The only legal action that’s been taken against CBD so far has been with retailers who sell the products. In all of the 28 states with medical marijuana laws in place, the use of CBD is also protected by those laws. 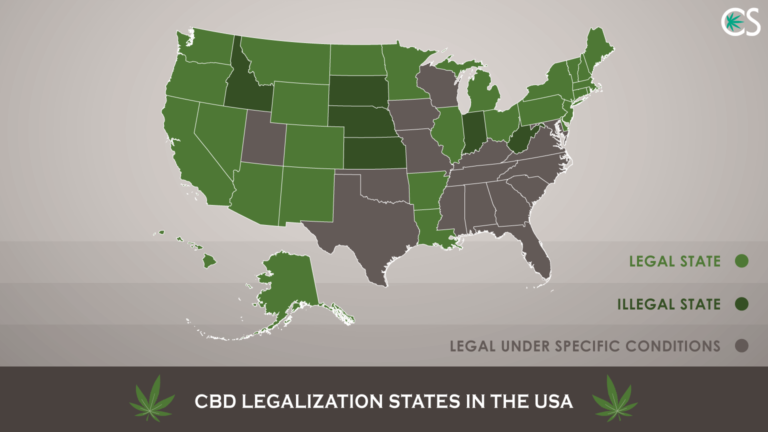 If you live in one of these states, you can use CBD with confidence. 28 + 6 = 34 states. So what about the remaining 16 states? In those 16 state states, there are what’s known as “CBD only” laws. CBD is legal under specific conditions (usually specific medical conditions like intractable epilepsy and with a prescription) in the remaining 16 states: Alabama, Delaware, Florida, Georgia, Iowa, Kentucky, Mississippi, Missouri, North Carolina, Oklahoma, South Carolina, Tennessee, Texas, Utah, Virginia, and Wisconsin. If you live in one of these 16 states, you should check for the most current law on CBD with your local government. ProCon.org offers a great place to start. Find your state and work from there. The National Cannabis Industry Association also provides an excellent chart of the United States which is updated frequently. What about Federal districts, inhabited territories, and Indian reservations? Since cannabis laws vary so much by location, the best thing to do is check with your local goverment on the laws where you live. Washington D.C.: cannabis is legal. CBD use is protected under the cannabis laws. Puerto Rico and Guam have medical use only. You likely need a doctor’s approval to use CBD. For the U.S. Virgin Islands, check with your local government. For the American Samoa and Northern Mariana Islands, cannabis is illegal. Cannabis use is legal on multiple Indian reservations. Check with the governing body of your specific reservation. Find the facts regarding updated CBD Laws by 2018 of each States. Indiana changed it’s law in 2018 and will be effective July 1, 2018 pending no further law changes. On Wednesday, March 21, 2018, Indiana Governor Eric Holcomb signed into law Senate Bill 52, which legalized CBD oil (having .3 or less THC content) for all. 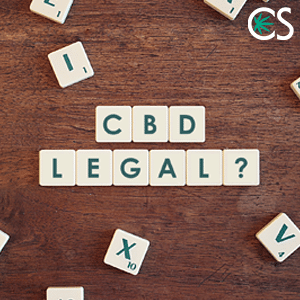 This comes after a turbulent set of months, which kicked off in November 2017 after the State Attorney General issued an opinion that under the applicable law (HEA 1148) CBD oil was only legal for those on the State’s registry. Thank you very much for that update. Is this pertaining to all kinds of CBD? Hemp oil is what I am most curious about. Can you address the changes in WI where the DOJ is determined to ban hemp oil sales and has even halted our newly passed industrial hemp growing leaving farmers scrambling. Hey Pati. The legal situation with CBD remains a challenge but I’m confident things are going to get better. This will take time, as all things of value do, but I do believe the law will change in our favor soon. I appreciate you taking the time to comment on this important topic. For Georgia On May 7, 2018, Gov. Deal signed HB 65 into law, which adds PTSD and intractable pain to the list of approved conditions. I am trying to find out more about this, as my mental health provider told me to “drive to colorado” to buy cbd oil when I objected to him raising the dosage on the medicine I am currently taking for PTSD. Jennifer, do you have a Medical Dr. who is willing to go online to The State’s Low THC Oil Registry & file the online paperwork for you? A Psychiatrist, an M.D. who is also board certified in Pain Mgmt or a your PCP is also an option. Go to your State’s website under GA “Low THC Oil” Program & look at all the medical conditions that you think apply to your personal situation. Choose the 1 medical condition that will harm you the least because this will become a permanent record. You may qualify under 2 or 3 conditions – or only 1 condition. I think it’s always best to be safe & error on the side of caution. The process is easy. I have an old friend who lives in GA & his Pain MGMT Dr went online & signed him up under the “pain” qualification. He got his card in a couple weeks – some state Govt Dept calls you & then you pick a location of that Govt Dept to go & pay them the $25 fee & pick up your card. Your GDL must match your Low THC Oil Card address. That’s all I remember him telling me. Oh, he orders his Oil from a Colorado Co & they ship it to him. Start with a high Quality less than 0.3% Low THC Oil made from the flowers of a Medicinal CBD Hemp plant like “Charlotte’s Web CBD Oil”. I know you can do a lot of 1st hand account info & research on YouTube from real people who have similar medical conditions that you do & you will find answers. My friend said the GA state law allows a 5% max for THC content & the CBD % content must be equal to or greater than the THC %… He said CBD oil has changed his life! Even saved his life! Don’t hesitate & move forward – get your card ASAP. JUST DO IT & my friend said he never thought it would work or even help him much, but his wife was adamant as she received an answer through prayer that going this route would help him treat the root cause of his Pain & not just symptoms. He has been slowly titrating down off of very high dose prescription pain meds – he said 2 different kinds. He is taking less than half of the doses he was taking & the CBD OIL is AMAZING for him. His Dr. is pleased & surprised. He said in another 6 months he is hoping to be completely off all pharmaceutical pain meds. I hope he can get there. I believe almost anything is worth a good try – DO YOUR research! As long as the CBD OIL is 0.3% THC or less, & comes from a State in compliance with the Industrialized Hemp Farm Bill, it is totally legal to have it shipped via a Private Business like FedEx or UPS directly to you. Don’t use the USPS while these gray legal issues still exist. Thanks very much for taking the time to share this information with all of us. Thanks for this awesome concise view at this often misunderstood issue. Hopefully there is a day soon where we won’t have to compare states and contradictory federal laws to understand the legality of such a great compound. CBD is legal in Kansas as long as it has zero THC content. Thanks for your feedback, Melissa! When the Federal District, and Capital of this Country~Washington DC, says Cannabis is LEGAL and CBD use is protected under cannabis laws, WHY is it Still ILLEGAL for everyone else EXCEPT for those who are making Cannabis Use ILLEGAL in the First Place?! Does that make ANY Sense At All?? Wake Up People!! If something is ok and Legal for the lawmakers of this country, WHY is it Illegal for the rest of us? It can’t be all Too bad if it is legal and safe for them to use. And if it’s legal and safe for them, that would mean it is safe for us, as well. So, what are they Really trying to hide and keep from us by making it Illegal?? Can anyone tell me about the cannabis and CBD oil laws in Washington state? Hey Rick! It’s always best to get legal advice from a lawyer. If it’s a general question, I may be able to offer my knowledge. What do you want to know? Only want oil without THC. Is this called the “hemp oil”? Getting the ones with and without thc confused. Need oil for terrible migraines , stomach issues, anxiety. Confused as to good brands , dosing , and extra information I would appreciate .. So tired of taking Rx meds that don’t always work . Help !!!! Can’t take the kind with THC in Alabama . Could get drug tested for work. Hi Kim. Thanks for your question. I completely understand your confusion and need to find a THC free product. “Hemp oil” is a term which most commonly refers to hempseed oil, a nutritious food oil made from pressing seeds from a hemp plant. This oil does not contain CBD or THC. For your situation, I recommend you seek a CBD hemp oil made from either CBD isolate or a CBD hemp oil which has definitely had the THC removed from the final product. You can verify this by examining the lab results and making sure there is zero THC. A third option for you would be any CBD product which is only made from CBD isolate. CBD isolate is simply purified CBD without any THC. I hope that helps. Let me know please if you have any other questions. As of April 2018, CBD oil that is THC free is legal in Kansas. Your website is no longer correct. Kansas changed the law and removed CBD from being considered illegial. In the state of Ohio I recently saw on the News that cbd oil is illegal and can only be sold under the medical marijuana program. But prior to that I’ve purchased it from a local health food store and even a gas station so was it not illegal then? Or is it that they are enforcing it now…confused!! Hey Brownskin. Thanks for your comment and updating us on this. Yeah, I know the CBD scene in Ohio is a little murky and confusing right now. My understanding is that the lawmakers there do not want CBD, since it is a cannabinoid found in cannabis, to be distributed by anyone but licensed medical cannabis distributors. But hemp CBD is still available for sale in many places. I expect the 2018 Hemp Farming Act, once it goes through, to make big positive changes for this. I was curious to know why you choose bluebird over Joy Organics. Is it more product preference or based more off your extreme knowledge of cannabis? I am using CBD now but would like to try one or two different manufacturers. Hey Jennifer thanks for your comment and question. I think both Bluebird Botanicals and Joy Organics are solid brands. They have different product offerings between them so it just depends on exactly what you are looking for. What brands do you like and use? Hi, I have Cigars Store in Miami, Fl. I need to know if I can sell CBD in my Store. Is Legal? The truth about CBD and why its illegal. Since GW Pharmaceuticals approval for the drug EPIDIOLEX on June 25, 2018 that contains 98% CBD oil it is considered an active ingredient which means its a drug. Since CBD is classified as a drug it does not qualify as a dietary supplement either. Any part of the hemp plant can be marketed to the public it just cannot contain CBD. Here is the real problem, CBD is often associated with healing potential and is thought to have many health benefits. CBD will have to undergo expensive clinical studies and may only be available through prescription, so sad. Some food for thought, sugar kills millions of people every year but the FDA classifies it safe for food. Hey Rod. Thanks for commenting and sharing your thoughts with us. Hello. I live in Florida and just got into CBD about a year now. I haven’t been able to find any info regarding any laws to being a CBD reseller here. Any info would help. So far all I have found in researching is that, I have to collect sales tax. Spoke to a few other resellers (private non-retailer stores), and they sell online, and have had no issues. Just wanting to be on the safe side though. Please let me know if you have any information.